The world has already seen a drone that shoots paintballs and a drone that shoots bullets. 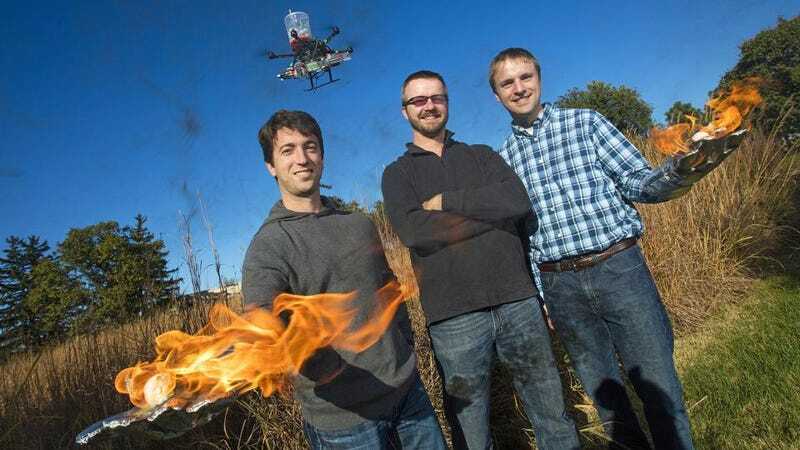 Now, thanks to a research team from Nebraska, there is a drone that shoots fire balls. But don’t freak out—it’s for a good cause. The newly patented fire-starting quadcopter looks like any other drone. Developed by engineers from the University of Nebraska-Lincoln, the device carries a silo of balls filled with potassium permanganate powder. Just before being dropped, the balls are injected with liquid glycol, setting off a chemical reaction that causes them to burst into flames within seconds. The idea is to use the balls to set and monitor controlled burns in order to get rid of invasive species and combat wildfires. Of course, it’s undeniably ironic that a firefighting drone would actually start fires. But the world is a crazy place, full of flying robots that do all kinds of zany things.